The Catholic Church granted the Servite Order a liturgical feast of Our Lady of Sorrows in 1667. In 1814 the feast was extended to the entire church. 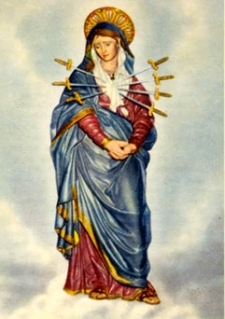 Devotion to Our Lady of Sorrows has been very strong throughout the Catholic world, notably in eastern Europe and above all in Latin America, as the Virgen de Dolores. She is often depicted with one or more swords in her heart, usually seven, as in the the statue of Maria Santissima Addolorata in the Servite Church of San Pier Piccolo in Arezzo, Tuscany (right, from www.immaginidimaria.it).